On their honeymoon in 1953 my parents visited Lübeck, Germany, to see St. Mary’s Church, the world’s highest Gothic cathedral built of brick. My father wanted to show my mother where he was baptized and confirmed. Eleven years earlier, on Palm Sunday 1942, an Allied bombing raid had attacked this jewel in retaliation for the Nazi bombing of England’s Coventry Cathe­dral. When my parents visited, repairs were under way. They could look up past the soaring arches and see the sky. Among the many works of art destroyed in the firebombing was a painted frieze that wound around four walls of the confessional chapel. It de­picted a common medieval theme: the dance of death, or Totentanz. In the painting, death dances with representative citizens, following a strict hierarchy. Death begins with the pope and the emperor, and then moves on to the cardinal and king. He slips a bony hand in the crook of the bishop’s arm, then the mayor’s. Death is all motion, leaping off the ground while the citizens of Lübeck stand stiffly resisting the inevitable: merchant, bailiff, nobleman, knight, doctor, moneylender, monk, hermit, farmer, sexton, peasant, maid, and finally, an infant in her cradle. For those who entered St. Mary’s chapel for confession, the city­scape of Lübeck depicted in the background brings the point even closer to home. The painting includes an exhortation to lead a righteous life while time remains. It is part of a genre of art that spread during outbreaks of the plague; in fact, a plague claimed thousands of lives in the vicinity of St. Mary’s only a year after the painting was installed. 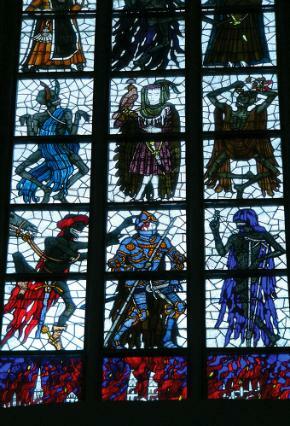 A new version of the Totentanz, completed in 1956, is a point of special pride. The stained-glass window is a faithful vertical version of the original but has a few striking additions. Death goes through the same social ranks, but when he reaches the baby he is forced to his knees and covers his face with his hands. The child is Christ, and to make sure we don’t miss this, a golden label floats over the baby’s head: DEO. The baby in the crib is swaddled in bands for burial and appears to be rising from his crib as from a tomb, hands raised in blessing. The other departure from the original is the representation of the cityscape. The buildings of Lübeck are there along the bottom of the window, but the city is being attacked by angry, red tongues of fire. This beautiful window draws millions of tourists each year. There is a sly social commentary in the original—the pope and peasant are waiting in line for the same dance partner. The point is the equalizing nature of our mortality. But given the church’s setting and history, that’s a lie. The 102 panels in this stained-glass meditation about death were all created within a decade of the Shoah in Germany, but there is no reference to the Holocaust. Not one piece of glass suggests the truth: not all deaths are equal. Not one piece suggests the lethal alliance of Shoah and church. Instead, Lübeck is envisioned as the victim of war with no role in and no contrition for the city’s complicity in millions of deaths. Streams of visitors come, take their photographs, and purchase their postcards, but leave without any mention of the Shoah. They receive no invitation to meditate on how they might live their lives in the wake of the Shoah’s macabre choreography.